I had the utter delight of watching 20 Million Miles To Earth with Ray Harryhausen in the audience, telling us how he made the effects in the film. 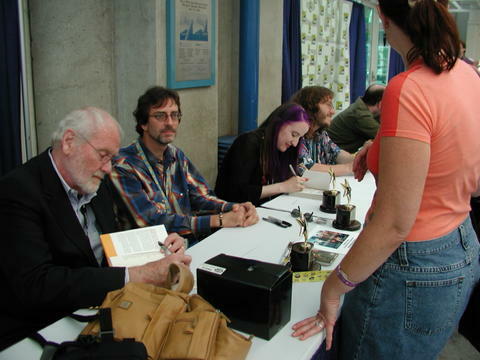 I attended two Stargate panels, and wandered the exhibit hall full of books, comics, films, and artists. 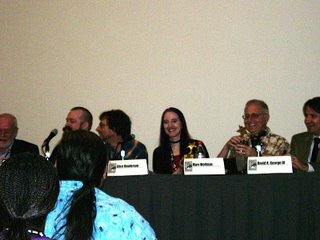 I caught up with fellow writers Christopher Golden, Jeff Mariotte and Simon Wood, and made many new friends. One of my fave comic book writers and artists, Chris Wisnia, was in attendance. He does these brilliant giant monster comics. I picked up the newest Doris Danger: Where Giant Monsters Creep and Stomp digest, and thoroughly recommend it to everyone! Chris's work is hilarious, vibrant, and a must-have for anyone who enjoys giant monsters. 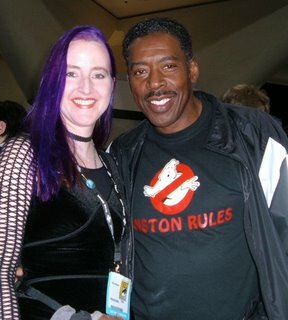 I also got to see Ernie Hudson again, who is utterly engaging, interesting and friendly -- a real pleasure to talk to. 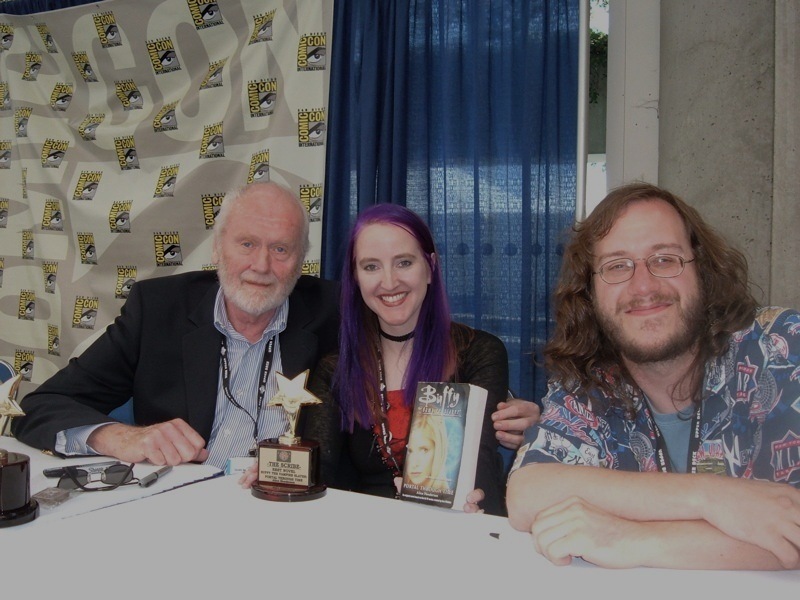 Just got more photos from Comic-Con! During the Scribe Award panel, we were grinning like crazy after winning. At the signing session after the panel, I had a great time talking with Don and Keith, and we signed quite a few books! 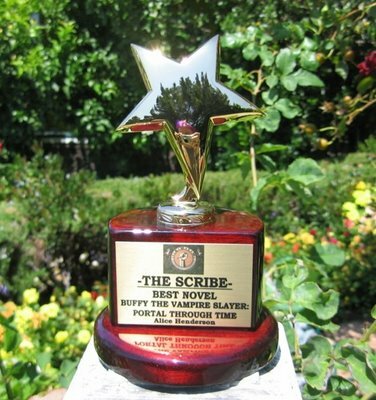 More On The Scribe Awards! Very handsome, indeed! I am thrilled! I Won A Scribe Award! 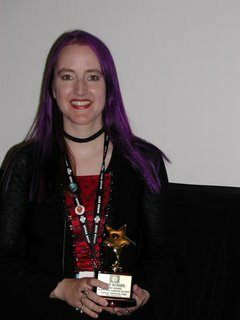 I am ecstatic to report that at the inaugural ceremony of the Scribe Awards, I won an award for Best Novel for Portal Through Time! Needless to say, I am walking on air, and my new handsome award sits on my writing desk now. 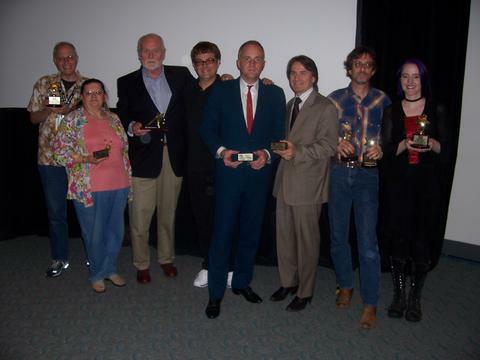 Winners in other categories included Marv Wolfman, for his novel Superman Returns; Jeff Mariotte for his novels Las Vegas: High Stakes Game and 30 Days of Night: Rumors of the Undead, the latter co-written with Steve Niles; and Christa Faust, for her novel Snakes on a Plane. The delightful Donald Bain won the Grandmaster Award for his prolific contributions to the field of writing, including 90 novels. Photos were taken of the event, which I hope to post soon!